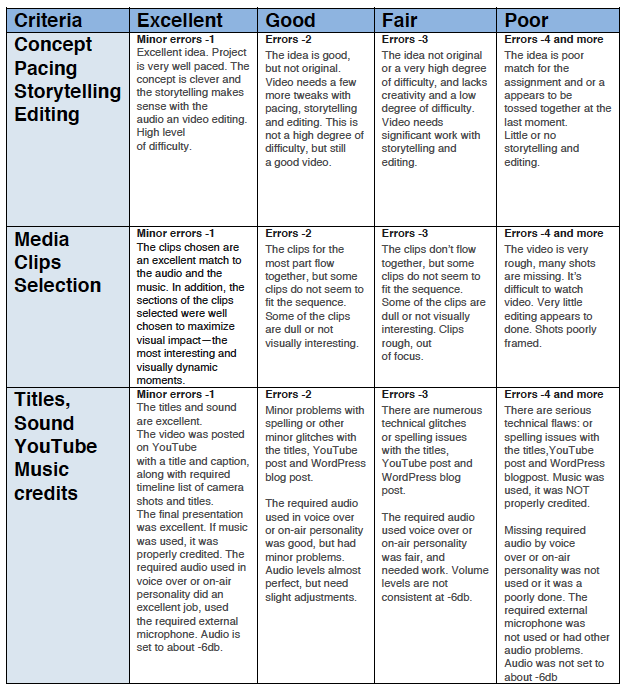 Introduction Video Assignment – Students will shoot, edit and produce a video creating a short introduction video. The emphasis is on using the camera, tripod and microphone. Students will learn how to adjust music and audio levels. Students work with partners for this project or alone. Each student will learn to be in front of a camera and learn all camera gear. Watch at least first three minutes of this video for ideas by Jonna Jinton from Sweden, see also her website. Use the translator on the left side to read in English. She started a blog and created opportunities with her photography, music, and much more. You are Editing YOUR OWN VIDEO, not a team effort. OTHER Details required, posted in D2L or blog post. One video for each person on your video team will be produced. Subject of video: Each person will create a simple introduction video and will be the subject. Other students will help shooting video, monitoring audio and serving as producers in the field. Possible Gear: Panasonic AC 90, iPad kit, iPhone, GoPro, DSLR, tripod, external microphone and head set. Bring your camera guide with you to make sure you have properly set your camera, audio, tripod and everything. ***Make sure you use tripod to shot video of you talking. Points deducted for unstable video. You will be asked to reshoot. Video Editing: All videos are edited with Adobe Premiere Pro CC. You will need to create a screenshot of the workspace in Premiere Pro to post in your WordPress blog post. See suggested script below to make video. This needs to be professional, or plan on reshooting. You can memorize your script or you can be promoted with questions. Make sure you are prepared and it does not should like it’s been rehearsed. It should look like you are having conversation, telling someone that has never met you about yourself. Prompting – If your team members are asking you questions, DO NOT include the questions for prompting in video, it will only be the person in front of the camera speaking included in video and their voice. Leave time, about 5 seconds or so between answering the asking answering the questions to avoid problems when editing, or plan extra time for reshooting your assignment. You can include b-roll, such as campus settings, but the emphasis is the person in the video. You can include music for the opening title and rolling credits. You must credit the music in the rolling end title. Crawling title (optional): You can use a crawling title to highlight awards, honors, GPA, student activities or something that’s important about you to a prospective employer or highlight your academic and career goals. Rule of Thirds: Avoid placing the person or subject in the center in the viewfinder. In the viewfinder, front of camera and behind: The majority of your shots should include the subject’s head and shoulders or chest and shoulders. You can include b-roll of subject walking for full length views.Watch the opening minutes of the BBC Viking Saga and see how the presenter is placed in the frame, almost never in the center, using the Rule of Thirds. Above all: Make sure your camera is tightly mounted to tripod, you are monitoring audio at all times with headset. Make sure you have properly set up the record settings, audio and all camera setting. Refer to your camera guide if you are in doubt. See sample script posted below. Watch the video posted below for ideas for your video. Your video must be at least one to three minutes minute in length. See related video, with a pitch by Jannet Walsh, posted on CNN videos. Use this for ideas for creating your own script. Note: This is meant to be an outline to write your script, does not to be exactly as below, but might help speed your writing process. Hi, I’m Your Name Here, student at Saint Cloud State University. I’m active with the student media on campus as the photo editor of University Chronicle newspaper, also writing and producing videos that air on the university station, UTVS. My goals is to own my own media company, work for major news agency, and travel the world. I am continuously updating my skills, recently created a WordPress website, websites using Adobe Dreamweaver with Bootstrap and editing video with Adobe Premiere Pro CC. This is Your Name Here, student from Saint Cloud State University. This is Your name here, Class of 2018, from Saint Cloud State University. 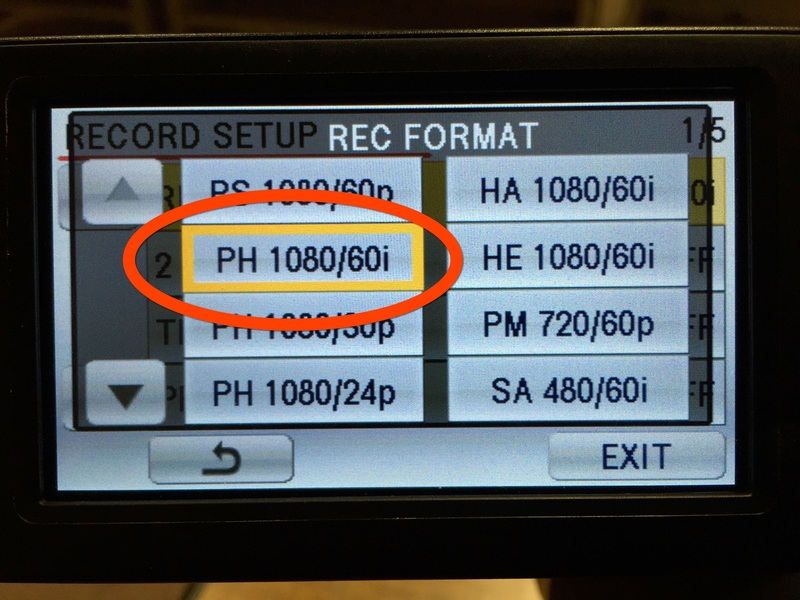 Panasonic AC90 – The recording format for this project is PH 1080/60i. View general reference guide for camera. You will need to provide. iMacs – The iMacs have a SD card slot or reader located on the back of the computer display. Locate the slot and insert your SD card. Create Folder in Data HD in iMac, portable hard drive – In the Data HardDrive or your personal portable hard drive, NOT jump or flip drive, create a folder for your video. Give folder your name, such as JannetWalshVideoProject. Name it something that will be easy to find. Private Folder – Copy the Private folder, located in the SD card on the iMac desktop, to the folder you just created, JannetWalshVideoProject. DON’T RENAME PRIVATE FOLDER. Do not take the files out of the folder. Move the entire folder named PRIVATE. More than one SD Card – If you have more than one SD card to download, create another folder inside video folder, JannetWalshVideoProject, and copy the next Private folders, but don’t rename. Follow this procedure for the next download. This will help prevent damaging video files during downloads. Removal of SD card from iMac – Before removing card, make sure you can locate all your files in your folder in the DataHD or personal hard drive. Use the ejection button on the keyboard to remove the SD card. Open Premiere Pro application, icon is purple with letters PR. Create new Project – Go to: File, new project or use the welcome window to create new project. Name it with a date and a name that you will know it it and easy to find. Save project in your video folder, Example: JannetWalshVideoProject, you created in the DataHD or your portable hard drive. Use the Browse button on the New Project window to go to the DataHD. The Scratch disk should be Same as Project location. Import Media Clips – Now you need to import the media clips you just copied from the Private folder, now located in the DataHD or portable hard drive. JannetWalshVideoProject. Import Media – Go to the Media Browser, lower left corner of Premiere Pro window, Shift +8. Next, navigate to your video folder, JannetWalshVideoProject, in the DataHD or portable hard drive. You will see your media clips appearing as thumbnail images. Right click on the PRIVATE folder with your media files, select IMPORT. COMMAND S to save. Your clips are now in your media browser ready to edited. 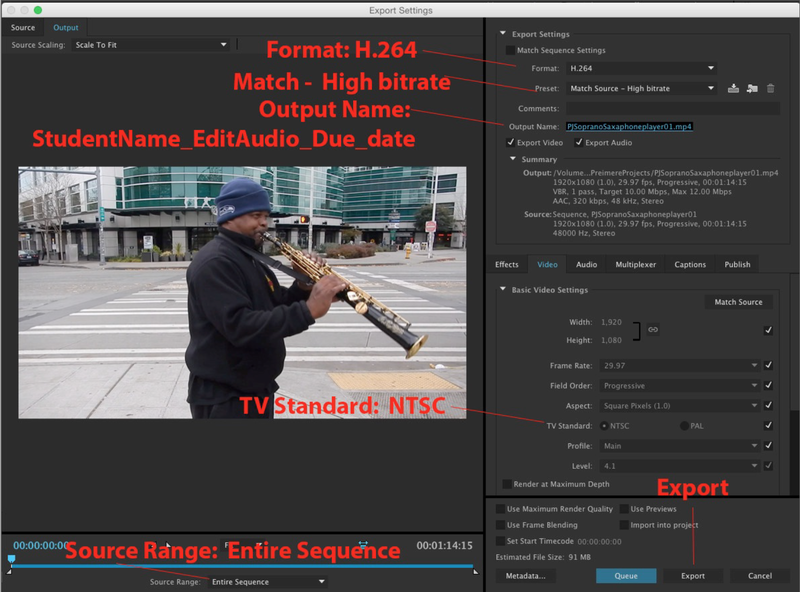 It’s in the Adobe Premiere Pro Program, updated for 2019! Music (Optional) – Keep it legal! You can use music in your video, but you must legally be able to use the audio track, such as Creative Commons license. Title templates are available for upload for this project from the D2L or create your own. Main or cover title – The main title of the video video is the title slide that introduces your video. Keep this simple. Create a lower thirds title, with the name of video and a second and third line, smaller text, but readable of the video partners. Time: about 5 seconds. Lower third title for each person in the video that is singled out in video, use a first and last name, if possible. Example: The on-camera talent or narrator must be named. Time: about 5 seconds or so. Crawling title (OPTIONAL) – Add a crawling title, it does not have to be long, a few words, adding extra details about your video or the location you shot the video. Make sure the speed of the crawl is readable. Time: The time needed to read the title with ease will determine the length of the crawling title. End title or credit – Rolling or still title at the end of video with copyright, details on music, artist and license you have for the audio. List the video partners that photographed, edited and produced video. (That’s you!) Time: about 5 more seconds or the time needed to read the title with ease. Check your spelling for all captions and make sure all titles are within the Safe Margins. Length of video – The length of the video is at least one to three minute in length, depending on editing. There’s many ways to edit a video with media clips and title slides. B-Roll has been added to video. (Optional) The video is well paced and the B-Roll appears to match the rhythm of the music. The video clips match the music flow and the edits are clean, with no gabs. Video transitions are added, but not necessary. 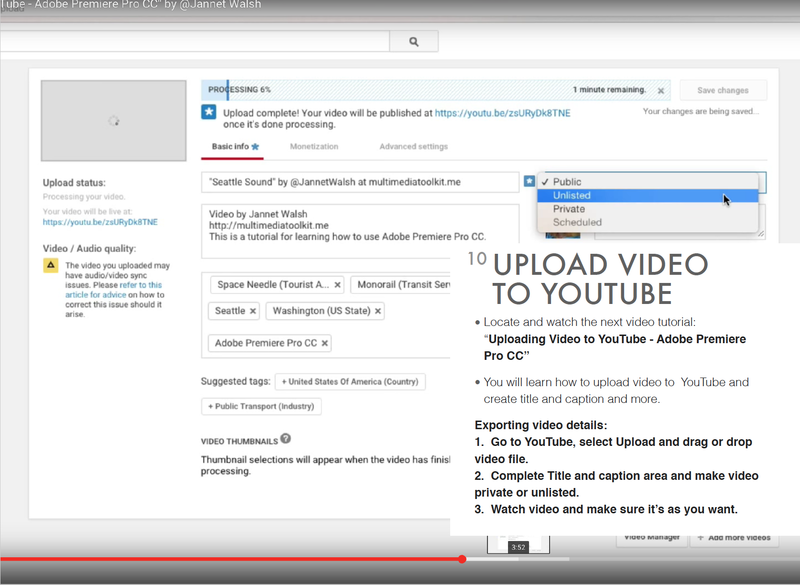 Complete title and caption area, make video UNLISTED, PUBLIC or NOT private!